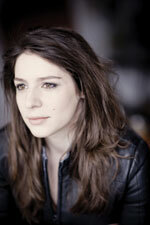 Elizabeth Watts won the Rosenblatt Recital Song Prize at the BBC Cardiff Singer of the World competition in 2007. In the same year she was awarded the Outstanding Young Artist Award at the Cannes MIDEM Classique Awards and the previous year the Kathleen Ferrier Award. She is an Artist in Residence at the Southbank Centre, and a former BBC Radio 3 New Generation Artist. Elizabeth was awarded a Borletti-Buitoni Trust Award in February 2011. Elizabeth’s critically acclaimed debut recording of Schubert Lieder for Sony Red Seal was followed in 2011 by an equally acclaimed disc of Bach cantatas for Harmonia Mundi, with whom she has an exclusive contract. She has performed with the London Philharmonic Orchestra and Yannick Nezét-Séguin; the London Symphony Orchestra and Michael Tilson Thomas; the Scottish Chamber Orchestra; the RIAS Kammerchor, Berlin; the Netherlands Philharmonic Orchestra; and with the Royal Philharmonic Orchestra in a programme of Strauss Orchestral songs. She has also performed with all the BBC orchestras, The English Concert, and the City of Birmingham Symphony and Hallé orchestras. Operatic appearances have included Marzelline (Fidelio) for The Royal Opera, Covent Garden; Susanna (Le nozze di Figaro) for Santa Fe Opera and Welsh National Opera, for whom Elizabeth has also sung Pamina (Die Zauberflöte); and Almirena (Rinaldo) for Glyndebourne on Tour. As a recitalist Elizabeth has performed at the UK’s leading venues including the Purcell Room in London, Bridgewater Hall in Manchester and at the Aldeburgh and Cheltenham festivals. She has also appreared at the Concertgebouw, Amsterdam, and at London’s Wigmore Hall. Elizabeth was a chorister at Norwich Cathedral and studied archaeology at Sheffield University before studying singing at the Royal College of Music in London. From 2005 to 2007 she was a member of English National Opera’s Young Singers Programme, where she appeared as Papagena (Die Zauberflöte), Barbarina (Le nozze di Figaro), Music and Hope in Monteverdi L’Orfeo and in Purcell’s King Arthur.